Green Wisdom can now land in your inbox today! 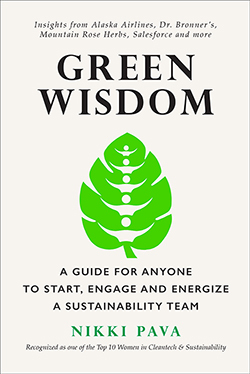 After two years of research, conversations, writing, and revisions, Green Wisdom: A Guide for Anyone to Start, Engage and Energize a Sustainability Team is finally here for public consumption! This is a collection of stories, research and best practices from some of the most innovative companies that are changing the way business works. This book is for those who WANT to get a team of people started on sustainability initiatives in their company and for those who already have programs in motion and would like some new ideas. Even people in the smallest businesses can learn how to make their company more socially and environmentally friendly – and make it fun for everyone involved. Purchase Green Wisdom for your kindle or e-reader. Stay tuned for the paperback version to be released in early Spring, 2019.